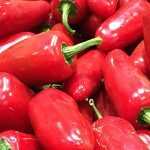 Chilli plants produce the fruit that proves heat and flavour to many cuisines. 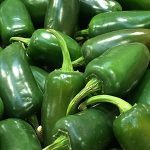 They are related to the well known capsicums and provide us with fruits we commonly call Jalapeño, Haberno, Scotch Bonnet, Poblano, Bird’s Eye as well many others. Chillies are grown in the garden as well as in containers, they need sun, moisture as well as a high potash fertiliser to fruit well. They also have a long growing season, so here is our way of growing Chilli plants from seed. Seeds should be planted close to the surface, less than 1 cm deep. Moisten using a spray bottle. Keep the soil temperature between 27 and 30 C .
Germination will commence in as little as 7 days and most should be sprouting within 14 days. The seedlings need to stay in the warm moist environment (bottom heat propagation tray until they have established good root systems. Wait until each seedling has 3 to 4 leaves. You can pot them up into larger pots as soon as they reach a size where they are easy to handle. DO NOT OVERPOT. Wait until the weather is warm and the danger of frosts is over before plating into the garden, or into outdoor pots. Your new plants need to be acclimatised (hardened off) to the full sun, so move them into morning sun for a week or so, and increasing into full sun. You should water regularly with a liquid seaweed fertiliser during this period. After two weeks of hardening off the seedlings should be ready to transplant into the garden, or into a container. Start Chilli seeds in early to mid spring indoors, in a greenhouse or a poly tunnel. Use a good quality potting mix with around 10% perlite mixed in for extra drainage. Plant seeds in small individual pots, and if you can, use a heated propagation tray to help with germination. With seed grown plants, pot them up gradually, this will improve growth rate and allow you to control watering. Planting Your New Chilli Plants. 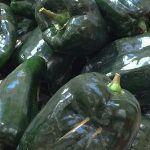 Once the weather warms up in early summer, plant your Chilies into the garden, or you might wish to grow them on in pots or containers. The actual month of planting out, will depend on the climate, it needs to be after the danger of frosts has past. They require a sunny position 8 hours of sun a day is ideal, 5 – 6 in the minimum. They are also best in a position protected from wind, especially cold winds. In the garden plant then at around 45 cm (18 inches) apart. In continuers choose a container that is 30cm (12 inches) across and at least the same deep. When planting out, you can plant them with more of the stem beneath the soil, this can be a benefit for taller ‘leggy’ plants. The stem will send out more roots and this is also beneficial. Keep the plants moist, watering after planting out with a liquid seaweed fertiliser. You can use a tomato fertiliser once the plants are established. In containers us a soil based compost with good organic matter. You can add some perlite to improve drainage. When watering, it is best to water deeply rather than often. It is also best to water with water that has been sitting in a watering can for a few hours as this will be warmer and the root system will appreciate this. How often you water will depend on the soil and climate. You can test the moisture with your finger, do not water if the soil is wet, wait until it drys a little. Try to maintain a pattern or moist soil, and then drier soil, rather than continually moist or wet. Many varieties are best pruned to maintain a smaller plant. This is especially true if you are in a warmer climate and want to over winter your chilli plants. If you don’t prune, you will eventual have plants that are to tall with woody stems. Look for low shoots that have good growth and prune to this. As long as you have good new shoots on the plant it will regenerate quickly. Generally try to prune back to around 20 cms. Always just above new shoots. After pruning its time to fertilise and water well. In a warm climate, you can keep a chilli plant alive for 5 years plus. In cooler climates you can try to overwinter plants by keeping them in a container in a position where the temperature does not drop below around 6C and stays below 12C. So dig them out of the garden, pot them up. Prune them back to around 15 – 20 cm and keep them reasonably dry over winter. If you are looking for variety when growing your own chillies, and this includes growing hot chillies, that are not readily available then growing them from seed is the best way. 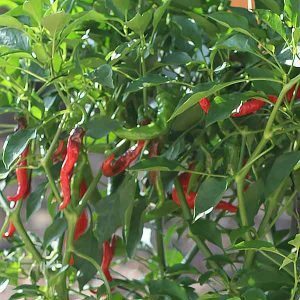 Growing Chilli plants in cool climates. 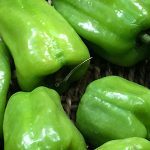 In cooler climates chilli plants are often best grown in a hot house or poly tunnel, anywhere that they will be protected from frosts and cold winds. You can grow them in pots and they will be productive, you have the advantage of being able to move them around to optimise warmth. Choose a large container for most varieties, use a high quality potting mix with some added compost and aged cow manure. Once the plants are established and begin to flower, this is the best time to add additional fertiliser, and chilies do thrive on fertiliser. You can top dress with aged manure, use liquid fertilisers, or use a slow release fertiliser designed for vegetables. In containers, pay extra attention to watering as they do tend to dry out more quickly. In cooler climates wait until spring before planting chillies outdoors. Even then it may be better to keep them under cover until late spring. In warmer climates you can plant them out much earlier. When you plant then out, you can plant them a little deeper than they were in the pot, they will send out extra roots. The soil should be firmed in lightly, enough to hold the plant upright without compressing the soil to much. Chilli plants are members of the capsicum family and are originally from South america. They grow well in warm climates, although in Australia, the hot afternoon sun can be a little harsh for them. 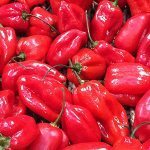 Easy to grow, and with so many varieties available, they vary not only in heat, which is measured on the Scoville Scale, 1 being very mild 10 being very hot, they also vary in flavour. To have access to the wonderful variety of favours and heat, you may wish to grown your own chillies, we tell you how to do it. You can buy chilli seedlings at most nurseries, and for many of us they are satisfactory. For the chilli fanatic you may want to grow some of the more exotic varieties from seed, it not difficult, and you will have access to range of flavours that and heat profiles that will astound you. One of the more important aspects of how to grow chillies is warmth. They are a plant that needs warmth, so plant them into the garden once the soil has warmed a little, spring to summer depending on your climate. Chillies came in an astounding number of varieties, choose the heat and taste profile that you like. Look specific information on that variety on how to grow chillies from seed, and then you are ready to plant the seeds. From here on its general care. When transplanting chilli seedlings to the garden, prepare the soil well by digging in well rotted compost. Plant the seedlings and water in with a liquid seaweed fertiliser. Watch out for pests and any sign of disease. From seed to fruiting chilli plants will take around 12 to 16 weeks.